3. About how many races have you attended in person? Zachary: 6 because I am usually driving classic cars on the weekend. Joseph: 50 which includes all series. 7. Do you enjoy stage racing or do you prefer no stages? Zachary: I am volunteering at the Driving Museum on the weekends so I couldn’t say. Joseph: I enjoy it. 12. Leaving this last one open for you to tell us about yourself, your company, what people might find interesting about you, or anything at all you want to say. This is totally up to you and can make as long as you want. Joseph: I am very outgoing and enjoy being with people. Interesting things? I enjoy go-karting and volunteering in many ways from making Easter Baskets and Christmas stockings for our local hospital for the last 10 years.as well as walks from Walk Now for Autism Speaks to March of Dimes, Crohns and Colitis Foundation. I donate to many charitable organizations and try to help others the best I can. Business: Lombard Bros. Gaming began about three years ago. Joseph and Zachary had a young fan, Jacob Wilhelm, whose parents contacted us asking if Joseph and Zachary would call Jacob on his birthday. They did and their dad (Chris Lombard) spoke with Jacob’s parents. Chris was so impressed with Jacob, who happens to be autistic as well as the boys, he said we should do something with gaming for special needs where someone like Jacob would not be booted from a game. Next came Alejandro Hernandez, another big fan of Joseph and Zachary’s. As they say, the rest is history. It seemed like this was the path we were to take since they are both high functioning Autistic individuals. Zachary diagnosed with Asperger’s Syndrome and Joseph on the spectrum. After much discussion we knew we wanted to create an online gaming channel which would allow all ages and skill levels an opportunity to game without being booted because of their age or skill levels. A place where they would not be booted. In fact, someone will be booted for intentional wrecking before someone who needs a place to gain more experience, and not be bullied for lack of skills. We are still very small business and really began based on Joseph’s YouTube channel (N2SC4R mature audience) but we are gradually growing and Zachary (MAGNUM05) has begun his livestreams on his Twitch and YouTube channels as well. Lombard Bros. Gaming has been very blessed in the past year becoming a sponsor for Ryan Sieg Racing. We could not be happier and happy to be a part of Ryan Sieg Racing, where the entire team has been awesome. We look forward to growing with the team in sponsorship as well as friendship. Class act group. We welcome everyone. All we ask is for them to show respect to others. If someone doesn’t have a game we invite them to come chat with us. Friendships are being built at Lombard Bros. Gaming. SUGAR HILL, Ga. (May 30, 2018) – RSS Racing is thrilled to welcome KMB Plumbing & Electrical as the primary sponsor for Ryan Sieg for the NASCAR Xfinity race Saturday at Pocono Raceway. KMB Plumbing & Electrical INC, located in Stroudsburg, has been in business for 27 years providing services for plumbing and electrical needs. The KMB staff is highly trained and all their work is fully insured backed by a 100% Guarantee. They service the Pocono Mountains Lehigh Valley and surrounding counties of Northampton and Lehigh from Milford to Easton and everywhere in between. Ryan Sieg and the #39 team head to Pocono with momentum on their side. After the race at Richmond three races ago Sieg was 50 points out of the final playoff spot. Following a 13th place finish at Charlotte the team is now only 13 points away from the final playoff spot. "It’s been a great month for our race team and we feel like we have turned a corner and found some speed. Poonco and Michigan is going to be a different animal with the new rules package but I’m confident it will work to our advantage," commented Sieg. The Pocono Green 250 takes places this Saturday at 1:00 PM ET on Fox Sports 1. SUGAR HILL, Ga. (April 24, 2018) – RSS Racing is thrilled to welcome Alabama Soda Blasting as the primary sponsor for Ryan Sieg for the Xfinity race Saturday at Talladaega Superspeedway. Additionally, J Pigg Construction will join the #39 team as a major associate sponsor. Alabama Soda Blasting, a business that specializes in removing coatings and rust on just about anything. "While most companies want to be involved in a big-name team we just love helping out this team with their never give up attitude. The whole Sieg family and friends are involved in getting more out of what they have than anyone one out there,” said owner Jim Jones. RSS Racing will again race three cars as it did at the season opening race at Daytona. Jeff Green will pilot the #93 Camaro and will have C2 Freight as his primary sponsor. C2 Freight provides custom, simple, cost-effective and dependable transportation solutions that provide your business with a competitive advantage. JJ Yeley will drive the #38 Camaro and will have Josh Roberts Trucking as his primary sponsor. Josh Roberts Trucking was founded in 2006 and has grown exponentially over the last decades. The company operates 47 trucks and has 65 employees today. The 113-lap race at Talladega is the ninth race on schedule for XFINITY teams. Driver Ryan Sieg currently sits 18th in series standings after a 21st place finish at Richmond. "This is a big weekend for our team. We feel like we have a chance to run up front and contend for the win. I would guess that between JJ, Jeff, and myself we have more laps at restrictor plate tracks than any other team in the race this Saturday. That should give us a big advantage for us a team," commented Sieg. Soda blasting is a fast and environmentally safe way to remove paint from virtually any surface without damaging the material under it. Soda blasting does not harm glass, chrome, aluminum, rubber, copper, brass, brick, stone, stainless steel, fiberglass and dozens of other substrates. Jones adds "But sometimes soda is not aggressive enough. That's when we will discuss the abrasive media that is just right for your project." 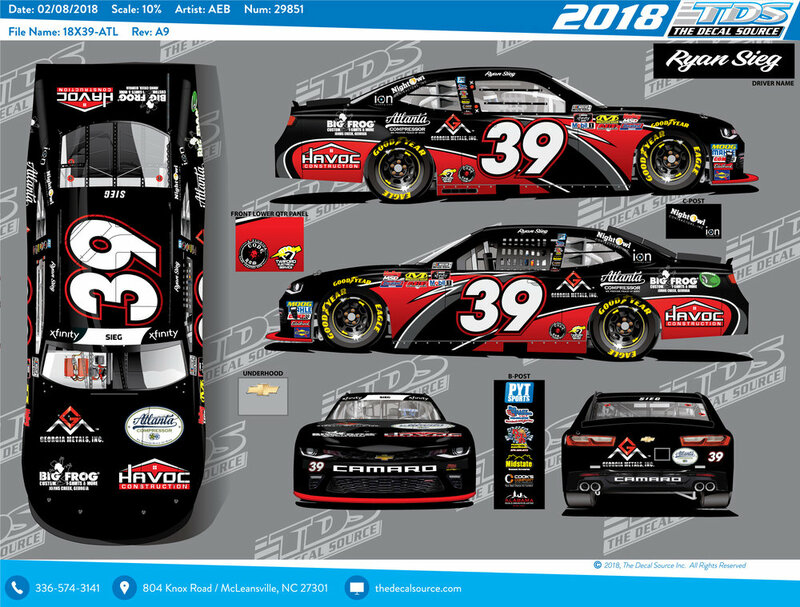 SUGAR HILL, Ga. (April 18, 2018) – RSS Racing is pleased to welcome Mike D’s BBQ as the primary sponsor for Ryan Sieg and the #39 Chevrolet for this Friday’s race at Richmond Raceway. This will be the first time the company has been a primary sponsor in NASCAR. Owner Michael De Los Santos started Mike D’s BBQ in 2013 and has seen steady growth each year since. Mike D's BBQ is a line of award winning signature BBQ sauces and all-purpose dry rubs. Their sauces are a twist on the traditional BBQ sauce with some unique seasonings and spice levels. This also marks a return to Richmond for him, as he grew up living on the city’s southside. Driver Ryan Sieg had his best finish of the season at Bristol where he came home in 15h after an eventful weekend. “Bristol was a roller coaster race day for myself and the team. I made a mistake in qualifying and wrecked our primary car just hours before the race. Our guys did some thrashing to get ready and I can’t thank them enough. To come home with a top 15 finish felt like a win. I’m hoping to keep the momentum rolling this weekend in the Mike D’s BBQ car..,” commented Sieg. Sieg currently sits 17th in the driver standings heading to this weekend’s race Richmond. 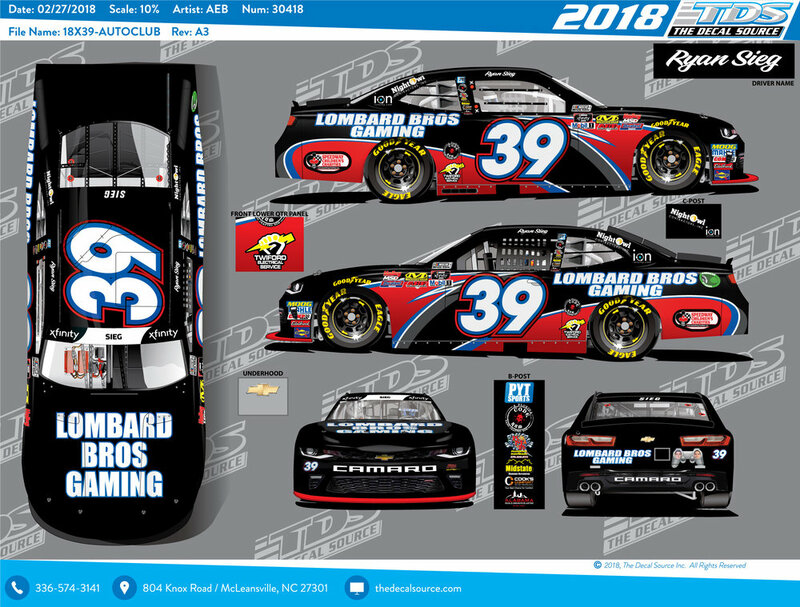 SUGAR HILL, Ga. (April 10, 2018) – RSS Racing is thrilled to welcome Lombard Bros. Gaming as the primary sponsor for Ryan Sieg at multiple races. The company was a primary sponsor for Sieg at Auto Club Speedway last month. Following a positive response from the sponsorship the company has elected to join Sieg at Bristol, Michigan, Iowa, and Road America. Additionally, RSS Racing has hired Mike Ford to help oversee the #39 car for the remainder of 2018. Ford lead the #39 car to the XFINITY Series Chase in 2016. The veteran crew chief was with the team last weekend in Texas. Driver Ryan Sieg is coming off his best race of the year at Texas where he qualified 11th and finished 18th. Sieg was able to gain valuable bonus points by finishing 3rd in the second stage. “It’s been a fantastic week for our race team. I’m so happy to have Lombard Gaming back with us for multiple races. I can’t thank them enough for supporting our team.,” commented Sieg. Sieg currently sits 17th in the driver standings heading to this weekend’s race at Bristol Motor Speedway. ionomy Studios is changing the way games are made and played. ionomy Studios makes gameplay more fun and more rewarding by designing games that leverage the ION digital currency ecosystem. To celebrate their passion for racing, ionomy Studios is launching a new game, Offroad Heat. As part of the partnership, the ionomy #39 car will also feature the new game, introducing Offroad Heat to live racing fans. ionomy is changing the way games are made and played. ionomy Studios is leading the way to design games that leverage the ION digital currency ecosystem. Gamers can have fun earning ION coin in weekly tournaments and can spend ION on in-game items at a discount. On the ionomy.com platform, users can manage their digital currency holdings, game assets and can view tournament leaderboards. The website hosts secure digital currency exchanges and wallets, providing easy methods for users to grow and secure their digital wealth. For more information, see ionomy.com and follow @ionomics on Twitter. “I’m excited to have such a neat sponsor this weekend at California. They have a message that everyone can get behind and I’m glad to have them on our car.,” commented driver Ryan Sieg. Sieg currently sits 20th in the driver standings following a 25th place finish at ISM Raceway last weekend. “We aren’t satisfied with where our program is right now. We are making many changes to get to where we need to be on speed. It’s not going to happen overnight, but I think in the coming weeks you will see us take some positive steps forward. SUGAR HILL, Ga. (February 27, 2018) – RSS Racing is happy to welcome Big Valley Towing as the primary sponsor for #39 car piloted by Ryan Sieg for the Xfinity Race this Saturday at Las Vegas Motor Speedway. The team will also support Speedway Children’s Charities as they will ride on the lower quarter panels of the #39. Big Valley Towing was founded in 2006 by the late “Big Dann” Collins and his wife, Debbie Collins. When Dann set out on Aug. 24th, 2011 to tow a truck on Interstate 10 from Arizona to Las Vegas, he was doing what he loved. But that day would end tragically: Dann was hit by a truck carrying an oversized load, killing him instantly. Debbie Collins continues to run Big Valley Towing, providing citywide Las Vegas towing, heavy-duty hauling and roadside assistance on her own. “It’s great to have our friends at Big Valley Towing back on board for the race this weekend. They have been great supporters of our team for the last few years. The Big Valley Towing car looks great and I can’t wait to get to Las Vegas as it’s one of my favorite tracks,” commented Sieg. The Xfinity Series will have two practices on Friday followed by qualifying and racing on Saturday. SUGAR HILL, Ga. (February 20, 2018) – RSS Racing is pleased to welcome four co primary sponsors for #39 car for the Xfinity Race this Saturday at Atlanta Motor Speedway. Ryan Sieg, who piloted the #93 at Daytona, will return to the seat of the #39 car this weekend. It will be a home town effort on all fronts this weekend for RSS Racing who is based in Sugar Hill, GA. All four sponsors are local to the Georgia area as well. Georgia Metals, Havoc Construction, Atlanta Compressor, and Big Frog Shirts will join the team in a unique sponsorship platform. Each company will have its logos on the hood, quarter panels, and rear of the car. “It’s awesome to have all four local companies join us for the race at Atlanta this weekend. Daytona was not what we wanted but the great thing about racing is that each week is a fresh start. The real season starts this weekend,” commented Sieg. Last weekend at Daytona Sieg fought brake issues and managed to finish 21st. JJ Yeley finished 18th in the teams #39 car and Jeff Green finished 11th in the #38 car. SUGAR HILL, Ga. (January 26, 2018, 2018) – RSS Racing is proud to welcome Code Rum as the primary sponsor for Ryan Sieg at Daytona Speedway for the XFINITY Series race on February 17th. Sieg will be piloting the #93 Chevrolet Camaro for the season opening race. Code Rum, who joined the team at Homestead Speedway last season, is a Florida based rum company making a big splash in NASCAR. Owner Johnny Ringo founded TREASURE COAST SPIRITS, INC. in 2013 with their first rum brand, CODE RUM! “I’m beyond excited to be back with the Sieg team at Daytona Speedway. I actually grew up in Daytona, so this is a dream come true to have Code Rum on the #93 car at such a historic track,” commented Ringo. Popular Daytona restaurants Wing House and Caribbean Jack’s will join Code Rum as associate sponsors at Daytona. RSS Racing is also pleased to announce primary sponsorship for twelve additional races in 2018. Ryan Sieg announced earlier this week that he will be returning the XFINITY Series full time. “I’m humbled to have so many of our sponsors returning in 2018. We couldn’t do it without their commitment to this race team. I think our Code Rum Daytona scheme turned out amazing and I can’t wait to get to Florida to hang out with the Code Rum crew,” commented Sieg. RSS Racing fields the No. 38, 39, and 93 Chevrolet Camaros in the NASCAR XFINITY Series. RSS Racing has competed in NASCAR events since 2009 from its headquarters in Sugar Hill, Ga. The team had its best career finish of 2nd at Iowa Speedway in 2017. The team recorded its best points finish of 9th with Ryan Sieg in 2016. For more information on RSS Racing and Ryan Sieg, please visit ryansiegracing.com or follow them on Twitter @RyanSiegRacing. SUGAR HILL, Ga. (January 24, 2018, 2018) – RSS Racing and driver Ryan Sieg are happy to announce a return to the NASCAR XFINITY Series for a full schedule in 2018. The Georgia based team will field two additional entries for Daytona and beyond. Veteran Jeff Green, who joined the RSS Racing last year will pilot the #38 car. The driver of the third entry has not been determined. RSS Racing will be entering its 10th season in NASCAR competition and will continue with Chevrolet as a manufacture. Kevin “Cowboy” Starland will lead the team as competition director. Sponsorship announcements for the team are forthcoming. Ryan Sieg will be entering his fifth full season in the XFINITY Series. Sieg finished the 2017 season 15th in the final driver points standings. “It’s great to return to the XFINITY Series in 2018 for the full schedule. It’s been a busy winter preparing three cars for Daytona but I’m looking forward to getting to Daytona and seeing where we stack up,” commented Sieg. SUGAR HILL, Ga. (November 14, 2017) –RSS Racing is proud to welcome Code Rum as the primary sponsor for Ryan Sieg at Homestead Miami Speedway this weekend. Sieg will pilot the #93 car this weekend and not the typical #39 number. Stephen Leicht and Jeff Green will complete the RSS Racing driver line up in the teams #39 and #38 cars. Code Rum is a Florida based rum company making its first splash into NASCAR. Owner Johnny Ringo founded TREASURE COAST SPIRITS, INC. in 2013 with their first rum brand, CODE RUM! After two years of planning and hard work, they officially launched the brand July of 2015 and made it into every Total Wine & More throughout Florida in their first year on the market! Today they currently have distribution in all of Florida and parts of Georgia. Ryan Sieg heads into the last XFINITY race of the season at Homestead Miami Speedway currently 15th in the standings. “Homestead is a fun place to race as a driver because you can run 3 different lines and still be fast. It creates for some fantastic racing. I’m excited to close out the season strong with our partner Code Rum. I’m thankful for all our sponsors, fans, and family for everything they do for our team,” commented Sieg.